In case you don’t know, Exmouth is a seaside town in east Devon, on the mouth – as the name may suggest – of the River Exe. 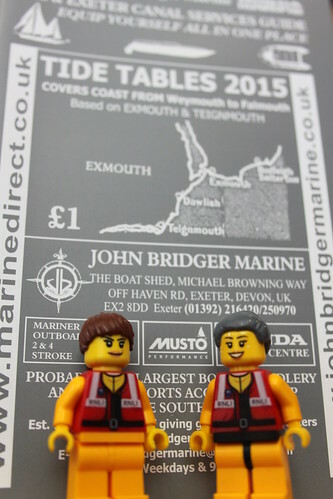 A pre-RNLI lifeboat was first stationed in the town in 1803, though the boathouse was washed away in a storm in 1814. However, the RNLI revived the station in 1858 and built a new boathouse. 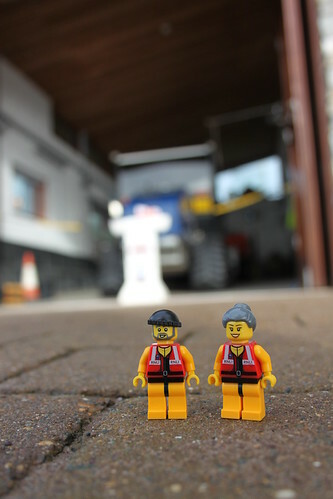 The station has had several boathouses and launching facilities since then, in various locations, to accommodate the different types of lifeboat that have been stationed there. The current station, which is situated at the eastern end of the beach, went operational in December 2009. And to save time when it matters most, the boathouse has a large slipway that leads directly down to the water. The station has two lifeboats. The first is the 13.6 metre Shannon class all-weather lifeboat ‘R & J Welburn’. The Shannon is the newest class of lifeboat in the RNLI fleet and Exmouth was only the second station to have one on service. The Shannon was designed in-house by RNLI engineers and is the first RNLI lifeboat to be propelled by waterjets instead of traditional propellers. With the boat’s twin waterjets powered by two 13 litre, 650 horsepower Scania engines, it has a top speed of around 25 knots and a range of 250 nautical miles. The station’s second boat is the five metre inflatable D class inshore life boat ‘George Bearman’. As regular readers will know, the light, fast and manoeuvrable D class is very much the workhorse of the RNLI fleet (and the little guys’ personal favourite), with a crew of three, a maximum speed of 25 knots and endurance at top speed of some three hours. The boat is powered by a 50 horsepower Mariner outboard engine. When we arrived at the station, we were met by the lovely Emma, who promptly offered us all a cup of tea. An excellent first impression! As we sipped our drinks, she told us about the station and its lifeboats. In fact, she was positively gushing about the new Shannon, which had only just arrived on station and – with its easy launching and increased speed – was set to increase dramatically the crew’s ability to respond to shouts quickly. Emma also introduced us to Andy Williams, the station’s full-time mechanic. 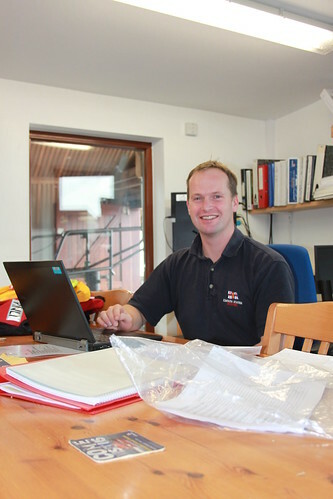 Due to the complex nature and maintenance requirements of the RNLI’s lifeboats, especially the all-weather ones, quite a few stations employ full-time mechanics (who are also members of the crew), to ensure that the boat is always ready for service. Andy works at the station weekdays from nine to five, but he admitted with a rueful smile that his pager always seems to go off at about quarter past five, just as he is heading home. With the boathouse being relatively new, it has been designed explicitly with the needs of a modern lifeboat station in mind. In addition to sheds for the two lifeboats, it has a crew room, changing areas for the inshore and all-weather crews, a museum/information area and a souvenir shop. The little guys were really impressed by the crew room, which is used by the station’s crew and other volunteers for meetings, training and other activities. (It’s also Andy’s office!) It has the most fantastic views across the beach and out to sea, and Emma explained that it’s easy to sit there on tenterhooks over the summer, watching the kite-surfers and hoping that they all get back to shore safely. On the wall in the crew room is a large calendar, listing the names of all of the station’s lifeboat crew. 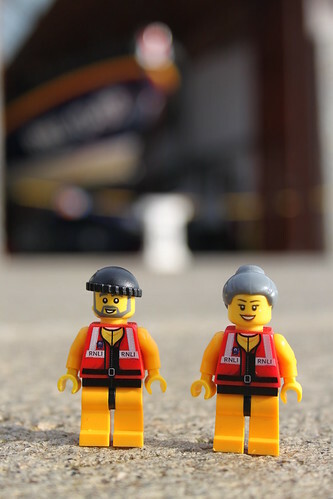 Emma explained that this is a common fixture to lifeboat stations, as it’s how they make sure that there are always sufficient crew members available in case the lifeboats get called out. Because while crew members generally live and work locally, some work locally but live elsewhere and others live locally but work somewhere else. And there will always be times when people are unwell, on holiday or have to travel for work. So each crew member indicates on the calendar when he or she is available and the station can make sure that it always has a full complement available should the pagers go off. 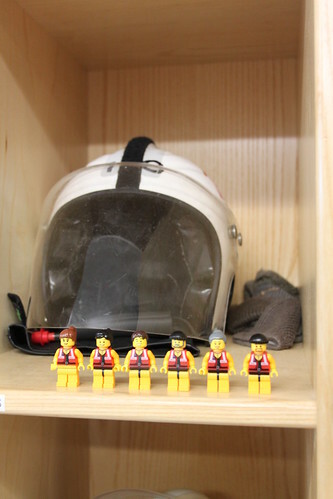 Next door to the crew room is the changing room for the all-weather lifeboat crew. And it was one of the tidiest rooms I’ve ever seen. Oilskins, lifejackets and helmets are all stored carefully, so that they can be donned at a moment’s notice. Emma explained that each crew member likes to store his or her kit in a particular way. As you can see in the photo below, for example, someone has rolled the tops of his or her boots down, to make them easier to put on in a hurry. The little guys would like this one, please. 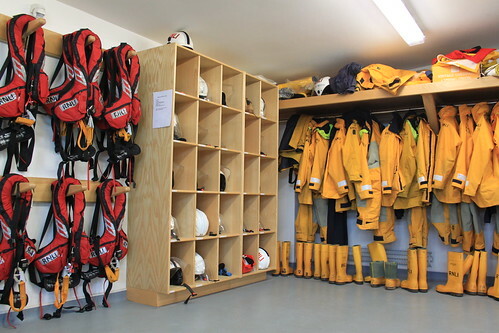 Downstairs is a similar changing area for the inshore lifeboat crew. 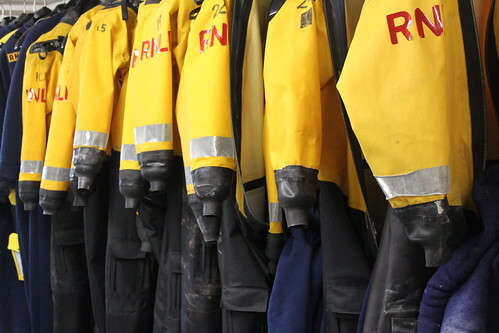 Except this time, instead of oilskins, the crew have rugged drysuits to protect them from the sea. (I know from experience that cold sea water is rather unpleasant, and that cold seawater that is being thrown at you at 25 knots is extremely unpleasant.) The crew also have thermal ‘woolly bear’ undersuits, worn under the drysuits, to keep them warm. 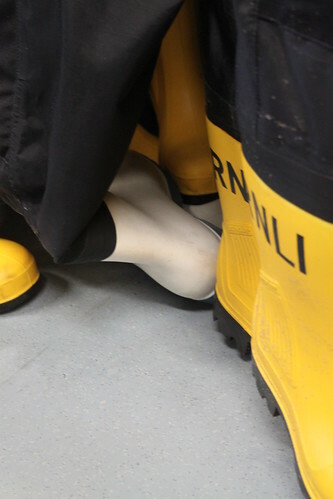 The drysuits come complete with bright yellow integrated wellington boots. We noticed, though, that one set of boots looked distinctly off-colour. When we asked Emma, she explained that one member of the crew is, quite literally, too big for his boots. The regular wellies only go up to a size 14, apparently, so an alternative had to be procured to accommodate the crew member’s size 15 feet. In case you’re interested, the wellies are white because they’re from a company that provides protective gear to slaughterhouses. Lovely. In addition to the areas for the boats and the crew, the station also houses a small museum/information area and a souvenir shop. While they were there, the little guys couldn’t resist introducing themselves to the volunteers in the shop and having a poke around. At this point, you might have notice that I’ve not talked much about the boats themselves. You might even be wondering whether, in our excitement at wandering around the station’s fantastic boathouse, we forgot all about them. Well, never fear, because we didn’t forget. In fact, we spent quite some time on the boats themselves. But to hear all about that, I’m afraid, you’ll have to wait for the next blog post. See you the same time next week! 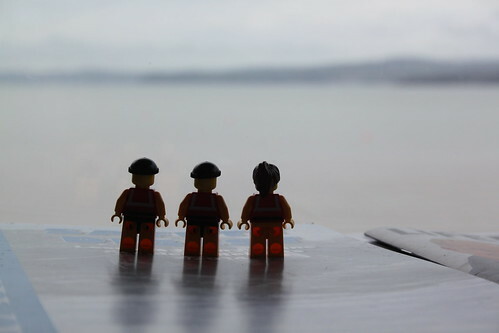 This entry was posted in Out and about and tagged Exmouth, RNLI, The Lifeboat Crew by Simon Perks. Bookmark the permalink. Hi My name is Rob Langenberg from Holland. I did an oil painting of the Exmouth lifeboat, Now I`d notice on one of your pictures that the reg,Nr, ends with 02 instead 03, now what is it please,I would like to know. From this point I can still chance it. Let me know please Thank you and Happy 2015. Thanks for visiting the blog. 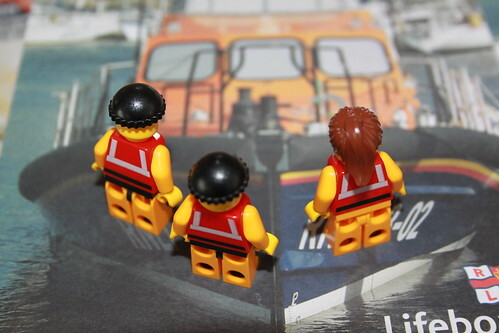 The picture of the little guys ‘reading’ a leaflet about the Shannon class lifeboat shows the Dungeness lifeboat, which has operational number 13-02. The Exmouth lifeboat, as you say, has operational number 13-03. So no need to panic! There’ll be photos of Exmouth’s Shannon on the blog next week. Dank u wel en tot ziens!